Preheat oven to 400 degrees. Toss the diced potatoes in the olive oil, salt, pepper, garlic, and Italian seasoning until all are coated. 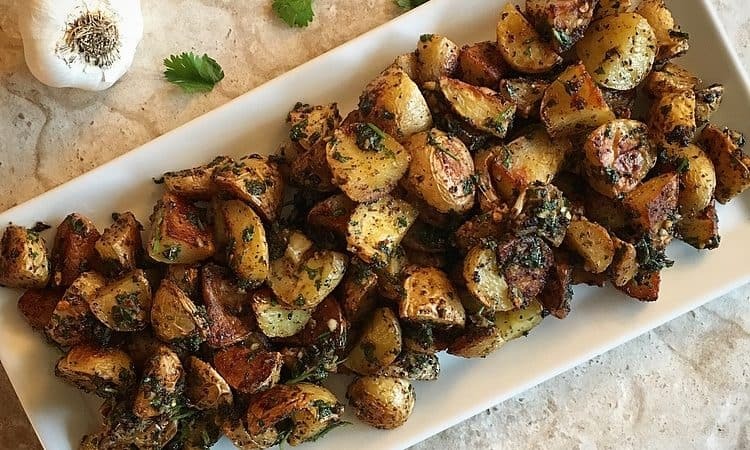 Spread out the potatoes onto a sheet pan. Roast in the oven for about 45 minutes till potatoes are tender and crisp. Half way into the cooking process, use a spatula to toss the potatoes around so they get evenly browned. Do the chimichurri sauce while the potatoes are in the oven. Just mix together all the components of the sauce in the food processor. Process for about 30 seconds. Once the potatoes are out of the oven. 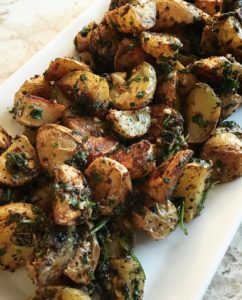 Let them cool for 5 minutes then while still warm toss them into the chimichurri sauce till all the potatoes are well coated with the sauce.